Hi everyone, sorry I'm late. It's just, it's been a brutal week for the loss of talented people. hasn't it? First designer Kate Spade then chef Anthony Bourdain, it's so hard to countenance. I'm sorry, let's switch over and watch Below Deck Med, where everything is lovely and complicated only on the surface. Rolling S3:E04 after the break. Hi guys, we finally got rid of those cranky guests from the last two weeks, wooooooo! Let's see who's gonna mess with our quirky group of yachties next on Below Deck Mediterranean! Hi everyone and welcome back to Below Deck Mediterranean where the sea and guests are MAD. Nichelle Gainey and friends are not having a good time and they're about to let Captain Sandy know exactly why. Rolling S3:E02 A Perfect Storm after the break! Hi guys! Long time no yachtsnark! Who's ready for some semi-maufactured dramz Below Deck in the high seas? ME TOO! Rolling the return of our Mediterranean gang after the break! 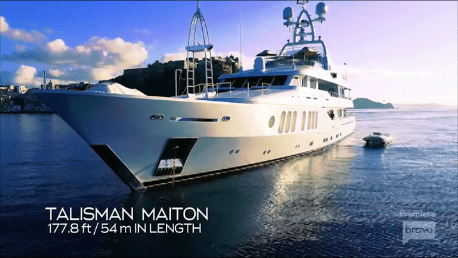 We're going to Italy on the Talisman Maiton!! This is it, the season finale of Below Deck season 5! Can you believe it's been 5 seasons??? Me neither! Let's find out what P.I.M.P Timothy Sykes thinks of the rest of his trip and most importantly: the last tip! Rolling S5:E14 after the break.